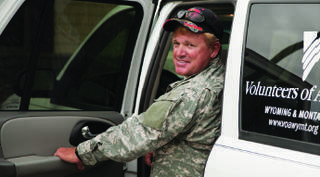 Volunteers of America Northern Rockies provides services to the homeless veteran population in Helena, Montana with the Homeless Veteran Reintegration Program (HVRP). This program is funded by the United States Department of Labor Veteran's Employment and Training Services. The Homeless Veteran Reintegration Program is designed to assist homeless veterans in obtaining meaningful employment to help sustain them and aid in the transitioning into a community and build a healthy happy life. The program networks with other service providers to ensure that a continuum of care is being met and that any gaps in service are being filled. We further work directly with employers and identify those who wish to hire veterans. We work with those employers with the benefits to hire veterans such as the Work Opportunity Tax Credit (WOTC). We have experienced and trained staff to ensure that the vocational needs are being met. After employment, we continue to work with veterans to ensure that the balance in their life is maintained. We are always here for when veterans need us. Helena, Montana continues to be a central source for homeless veterans which prompted Volunteers of America Northern Rockies to address this and provide the services to these men and women to aid in stabilizing their lives and their future.